All Artisan Essential Oils are obtained directly from trusted eco-friendly growers and distillers. Each of the Artisan Essential Oils was personally selected by Dr. Joie Power and is of the very best quality. These Artisan Essential Oils are not mass produced - they are produced one drop at a time by folks who care about what they're doing and strive to offer the very best in essentail oils. These exquisite oils offer excellent value considering the individual attention given to producing each one by people who care about their rare and unique nature. When you inhale the aroma of any of our exceptional Artisan Essential Oils, you will immediately recognize it as being one of the finest oils anywhere. The School no longer sells products but, for all of your Essential Oil and Aromatherapy needs, we recommend purchasing from: Artisan Aromatics. Artisan Aromatics can provide you with everything we offered plus much, much more! 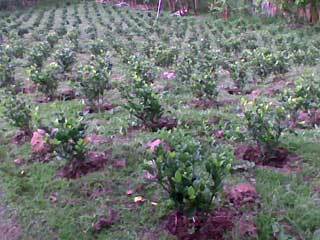 Gardenia Main Chemical Components: Benzyl acetate with phenyl acetate, linalol, linalyl acetate, terpineol, methyl anthranilate, et. al. Palm Kernel Main Chemical Components: glyceryl laurate (0.1%, myristate (0.1%), palmitate (44%), stearate (5%, oleate (39%), linoleate (10%), and linolenate (0.3%). Note: Purchase made from Artisan Aromatics' Cart Description and Uses: Our organic Gardenia Solid Perfume / Body Butter is very rare. In fact, we cannot find anyone else anywhere who sells it. This Gardenia Body Butter is created as the middle step of Enfleurage. 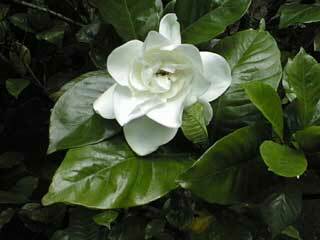 Rub just a dab on wrist, behind ear or at nape of neck to experience the sensual aroma of pure organic Gardenias. The entire process of producing these solid perfumes (we have Tuberose body butter too) is done by hand using no heat and no chemical solvents. Pure local palm oil is used to absorb the aromatic oils from the flower petals and once the palm oil is completely saturated with the essence of the flower it becomes a "body butter" aka "solid perfume". Note: More information on our organic Gardenia oil is Continued Below. More Info: Gardenia jasminoides was first introduced to the Western world from Cape Colony in Africa, and its name comes from the fact that the aroma of its large white flowers was said to be very like the scent of jasmine. Gardenia is one of the most precious oils in the world and known for its heavenly aroma and fragrance. During the extraction process, fresh, fully opened flowers are plucked from the Gardenia plant and carefully laid on trays covered with a layer of palm oil. The essential oils from the flower petals slowly migrate to the palm oil and the process is repeated until the palm oil is completely saturated with the oil of the Gardenia. Then the Gardenia oil is separated from the palm oil by alcohol which then evaporated leaving only the pure Gardenia oil, i.e., Gardenia Essential Oil. 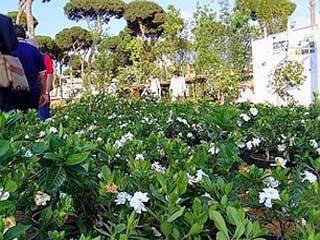 Gardenia cannot be distilled like most essential oils due to the delicate nature of the flowers. Enfleurage was the traditional method of extraction used into the early 20th century but solvent extraction using hexane has virtually replaced enfleurage, except, of course, for our own Gardenia Essential Oil. Solvent extracted Gardenia, called an "absolute", is used extensively by the perfume industry but, again, not by us (no chemicals are used to extract the that we sell). Either method (enfleurage or solvent extraction) is time consuming and oil yields are quite small for the amount of materials used. Now, the most commonly found Gardenia used by the perfume industry is entirely synthetic and has no healing properties whatsoever. As a perfume, Gardenia is often enjoyed as a single-flower oil since the rich, warm, heady floral aroma produced from the flowers is considered osmically balanced (like Carnation and Lavender). which means that their floral compounds are perfectly balanced, containing a top, middle, and base note. The Gardenia jasminoides species is the most common of these fragile plants and material from dried Gardenia flower petals is commonly used in Chinese herbal medicine. Its Chinese name is zhi zi. The traditional medicinal actions attributed to gardenia include calming irritability; cooling blood and clearing away heat (a yin/yang imbalance often characterized by deficient yin); reducing swelling; and moving stagnant blood that has congealed in one place, usually following trauma. Gardenia is considered to be very effective as a hemostatic agent, which means that it stops bleeding; and also effective in treating injuries to the muscles, joints, and tendons. Gardenia is commonly used in Chinese herbal formulas to treat infections, particularly bladder infections; abscesses; jaundice; and blood in the urine, sputum, or stool. Because of its perceived ability to ease agitation or irritability, it is also used in formulas to treat anxiety or insomnia. It is also helpful in correcting menopausal imbalances reflected in insomnia and depression, nervous tension, headache, and dizziness. The United States Department of Agriculture Agricultural Research Service phytochemical and ethnobotanical database lists Gardenia jasminoides as having specific medicinal properties. This gardenia has been found to be helpful in the treatment of pain, nose bleeds, fever, and influenza; in healing wounds and reducing swelling; and in treating mastitis, hepatitis and the hematuria that accompanies bladder infection. Parts of the above "More Info" was derived from an online article: Encyclopedia of Alternative Medicine, Apr 06, 2001 by Joan Schonbeck.